Nicholas Bradley is an associate professor in the Department of English at the University of Victoria. 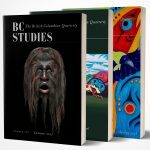 His research focuses on the literary traditions of the Pacific Coast of Canada and the United States. Shannon Croft is currently pursuing her PhD in archaeology at the University of York, England, where she is continuing her microscopic studies of hunter-gatherer lifeways. As part of the POSTGLACIAL project at the Star Carr site, her research goal is to establish the role of stone tools in shaping social responses to climate change and to develop an integrated “forensic” approach to the analysis of the artifactual and molecular debris left by human activity. As well, she is undertaking the Professional Specialization Certificate in Museum Collections Management at the University of Victoria, BC. Shannon’s current interests include: paleoethnobotany, microscopic residue analysis, the British Mesolithic period, museum exhibit curation, and public outreach in archaeology. Marina La Salle studies heritage in the University of British Columbia’s Department of Anthropology. Her current research looks at ideology and the social construction of “nature” in Vancouver’s Pacific Spirit Regional Park. Rolf Mathewes is a full professor of Biological Sciences and an associate member of the archaeology department at Simon Fraser University since 1975. His research interests focus on paleoenvironmental reconstruction using pollen, spores, and plant macrofossils from sediments, peat bogs, and archaeological sites, mostly in Western Canada. He has a BSc in biology from Simon Fraser University and a PhD in botany from the University of British Columbia in 1973. He has also conducted research in Scotland, Switzerland, and in the Black Forest of Germany as an Alexander von Humboldt research fellow. Daniel Ross is a PhD candidate in history at York University. His dissertation looks at how debates over public morality, development, and civic identity have played out on Toronto’s Yonge Street since the Second World War. He blogs at historiandanielross.com.